Often listed as merely an asterisk in history, Lady Jane Grey did have a part in the tale of the Tudors and in the succession of the crown. A teeeny tiny part, but a part nonetheless. Her young life and limited time on the throne may have been short, but it was long on drama. Did she end up remembered as the Nine Day Queen because of manipulation and lust for power? Whose? Was she a puppet or did she know what she was doing? The brief life and rule of this teenage royal is worth a bit of a chat, don’t you think? We did. 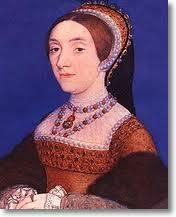 Jane Grey was born in October of 1537 (or perhaps in 1536) to Lord Henry and Lady Frances Grey. If you like a little title with your history, that would be the Marquees of Dorset and Frances Brandon, niece to King Henry VIII. Frances’ mother was Mary- the sister of Henry- and her father was Charles Brandon, Duke of Suffolk and life long frat bro of Henry. 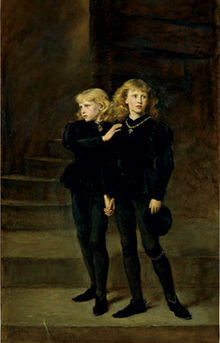 Later, after his and Frances’ brothers’ deaths, Frances would inherit the titles and she and Henry would become the Duke and Duchess of Suffolk . 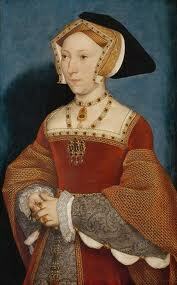 Jane was also born about the same time as her cousin Prince Edward, son of Henry VIII. Linking Edward to Jane was an easy move on the part of her parents. Cousins marrying was far from unheard of, and Jane was raised with this goal in mind. To add a little more incentive to the mix – as the only son of the king, Edward was next in line to the throne. They had so much in common- Edward was was raised Protestant- just like Jane. If you have paid any attention to our ongoing Tudors series (and you should, it’s very interesting) religion plays a big part in the story. (And we always explain more in our podcast than in these notes). Jane and her sisters Katherine and Mary (yes, we have heard those names before) were educated at home, taught to read Latin, Greek, French, Italian and groomed for well placed marriages that would bring the family more power. 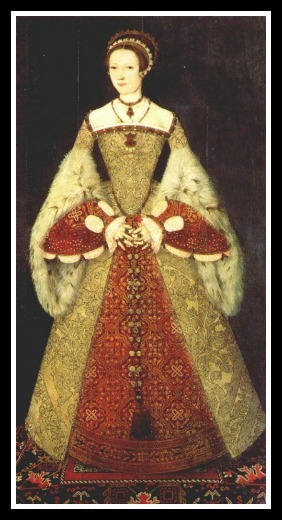 At nine, Jane’s guardianship was given to Katherine Parr, the then-wife of Henry VIII. Upon his death, and Katherine’s subsequent marriage to Thomas Seymour (we cover this in the Four Wives podcast) Jane’s wardship was turned over to the Seymours. Why? Because it was thought that this was the best way to arrange a marriage between Jane the new king, Edward VI- a marriage that would suit all parties involved. 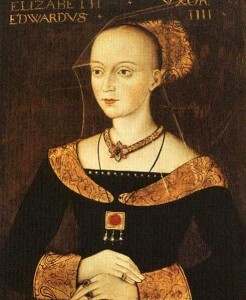 This portrait is often cited as being of Jane Grey, but there is much dispute that it is, in fact, of Katherine Parr. Actually, a great number of portraits that were believed to be Jane were proven to be someone else. Rather than be frustrated,we think it's fun to watch what we think was known reveal itself to be something else entirely. It's like a game! But Katherine died in childbirth a short time later. And Thomas followed her to death when he was executed a year after that. Jane’s guardianship was up for grabs again, and who better to secure her future as queen than the chief counselor to King Edward, John Dudley, the Duke of Northumberland. Dudley was a very powerful man in a sweet position, who wanted to remain that way. He knew that if Edward produced an heir, Edward’s sisters, Mary or Elizabeth, would not rule, toss him out…or worse. But if he could marry Jane to the king- who was also in line to the throne (via her mother who was willing to let it pass to Jane) he might just be able to hold onto all that was near and dear to him. Like his head. But his plan was flawed. Edward became very ill and it was clear he would not live to marry, let alone produce an heir. So in a swift coordinated effort with Jane’s parent’s-Dudley married 15 year-old Jane off to his only marriageable son, Guilford. It was a hot mess of a wedding that also married off his daughter and one of Jane’s sisters to well-placed men. When Edward died very shortly afterward, Dudley did a fancy dance of deceit – badda bing, Jane is Queen. Everyone is happy. Except Jane who never wanted to be Queen and was frightfully unprepared for the position. Oh, yeah, and except for Mary who foiled a plot of Dudley’s to have her thrown in the Tower of London and knew that it was her turn to rule. Mary knew that she was entitled to the crown, and she had the support of the people behind her (We do cover all of this time in the Mary I podcast). 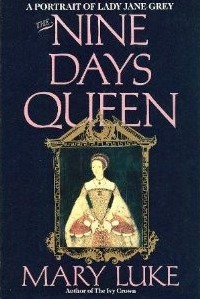 For nine days Jane was Queen Jane. And then Mary took care of that. Mary tossed Jane and Guilford in the tower, where they remained for several months. It wasn’t horrible living conditions, but it was imprisonment. 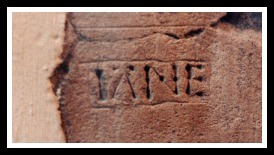 Rumor has it that this tribute, in the Beauchamp Tower, was carved for his wife by Guilford himself . This humanizes him a bit ( which his legacy totally needs). At first, Mary did not want to execute them. However, an ill-fated attempt to over-throw Mary -led by Jane’s own father- made Mary think that this decision was necessary. On February 12, 1554, less than a year after being imprisoned, Lady Jane Grey and her husband Guilford were beheaded. 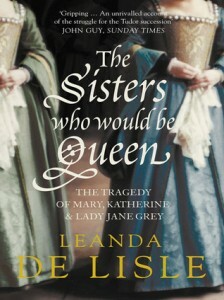 An website with an easy read of her life, Ladyjanegrey.org . Or this one with a very lengthy description, as well as some links to outside sources (although not all the links are currently functioning) EnglishHistory.net . Tweet what, you say? 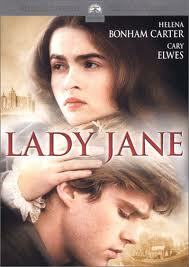 We love it when we find an active twitter for one of our women- Lady Jane Grey Info. Of course we have some book recommendations, have you just met us? And a movie, that isn’t exactly historically accurate (are any of them?) and we dare you not to have Princess Bride quotes running in your head if you watch it! With this episode we continue our series on the Tudors. 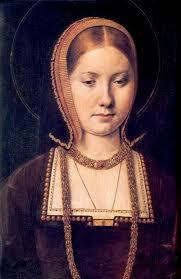 Henry, Henry, Henry… First Catherine of Aragon didn’t produce, so you divorced her. Then Anne Boleyn failed as well, so you took care of that nuisance. In this episode we talk about the last four of your wives, or as we like to call them, Mommy, Sister, Party and Lucky. 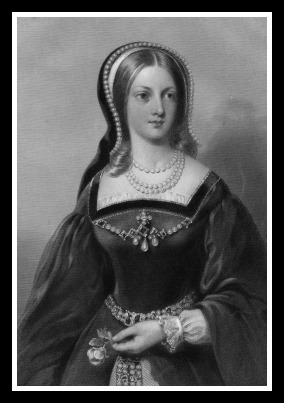 Jane’s brothers were also in service to King Henry VIII, and she was probably used as a pawn for family gain, but Henry wasted no time- betrothing her within 24 hours of Anne Boleyn’s execution.They were wed within two weeks. We all know what Henry was after, a male heir. Jane looked like a promising vessel to bring that to him. Henry’s illegitimate- but recognized- son, Henry Fitzroy, died shortly after the marriage at age 17. With that, the back-up plan crumbled and Henry has no heir options. We talk a bit about what happened in this short marriage during the podcast, but Jane is pregnant within a year and gives birth to a son, Edward, who would one day, briefly, succeed Henry VIII as King. 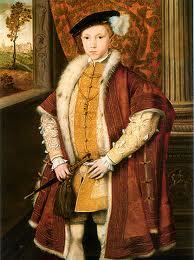 Future King Edward VI, Henry! You got a male heir! Sadly, the hand that was dealt to his mother, Jane, was not so kind. She died of complications from childbirth about two weeks after Edward’s birth. Henry needs a wife! So he quickly put his people on the task of finding one. The fate of his previous wives has people rethinking the Get This Daughter Married to Henry to Further Our Family strategy. Pickings are getting slim, and political gain is the main objective. Born in 1515 to John, Duke of Cleves and his wife Mary, Anne was intelligent, meek and proficient in needlework (which is middle ages speak for “She has a great personality”). Lord Cromwell sticks his nose into the scene yet again. He thinks that this Protestant German Princess, or her sister Amelia, is the ticket. 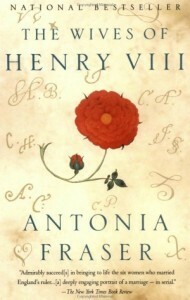 Henry sends an artist to paint portraits of the women, sees Anne’s and signs the deal. Anne was a very charming teenager of about 19, but she was far from the image that the King saw. The artist may have been mesmerized by her personality when he painted the portrait in her best light, and also neglected to add the smallpox scars that dotted her face. She was simple, spoke no English and was quite unsophisticated by English court standards. But Henry really isn’t marrying her for her looks, merely for political gain. She travels from her home land to England, and they are married in January but Henry can’t take it. He claims that the marriage was never consummated, pulls some of his old tricks out of his pocket, and they are divorced by July. But Henry wasn’t heartless, and he did seem to care for Anne. He sets her up, treats her like a sister and she lives her days out happily in England and- in 1557-she is the last of Henry’s wives to die. But that doesn’t solve the Queen problem- Henry needs one. Court has always been a good place to look and he quickly finds his next vic…wife. Kathryn Howard. Kathryn was born in 1521, the daughter of Lord Edmund Howard, who was the younger brother to the Duke of Norfolk who we have discussed before ( sneaky!). 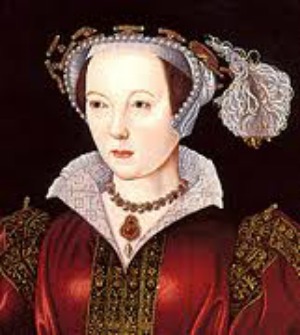 Kathryn was also the first cousin to Anne Boleyn. Her mother had died when Kathryn was nine and she was sent to live with her Step-grandmother. During this time, Kathryn probably did not have much guidance because she began her party-girl ways very early, having suspected lovers before she was sent to court to serve as – yes!- Lady in Waiting to Anne of Cleves. This is where Henry falls for the beautiful young (19) Kathryn. A mere 16 days after his annulment from Anne, Henry VIII takes his fifth wife, Kathryn. He is quite smitten, calls her his, “rose without a thorn” and claims her to be the,”jewel of womanhood”. But Henry, almost 50, overweight with an ulcerated leg is not exactly the most attractive man around. Oh, no. And Kathryn? She’s young and fun and after a year still not pregnant. She is linked to liaisons with several men; charges that she has had affairs materialize. Henry is devastated. He has the men executed and within two years of marriage, Kathryn and her Lady in Waiting, Jane Parker Boleyn, (she had been married to Anne’s brother George) are sent to the Tower of London. 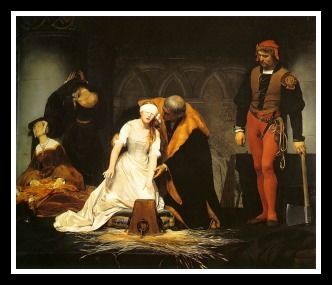 Kathryn meets the same fate as her cousin, and is beheaded and buried near her. Poor Henry, another wife gone. And heartbroken to boot! (insert tiny violin here). Obviously his wife finding methods were faulty, this next time will be different. Enter Catherine Parr. 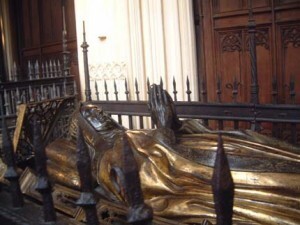 Her parents, Sir Thomas and Lady Maud Parr served under Henry VIII. 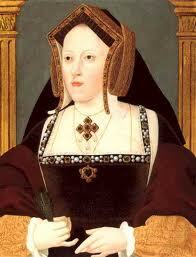 Her mother was a Lady in Waiting to Catherine of Aragon, and her father was the Controller of the Household. Catherine Parr may have been educated with Princess Mary who was only 4 years younger. She was bright, educated, refined and married, and widowed, by age 20. Her second marriage lasted longer, although by age 30 she is once again a widow. She then fell in love with Thomas Seymour, brother to late Queen Jane, Uncle to Prince Edward, but Henry put a stop to that. His options for his next wife were becoming limited and he looked at this woman that he had known for a very long time and knows what he wants. He convinces Catherine to break ties with Thomas, and marry him. She is a very loyal wife, a good companion to the aging, almost bed ridden, 300 pound monarch. She took her Queenly duties seriously and handled them with a composed and mature manner. Henry named her Regent when he headed off to invade France, showing his trust for her. We talk in details about the four year marriage, but Catherine was a good Queen and a provided stability to the royal family. Her release from her duties came when Henry VIII died. 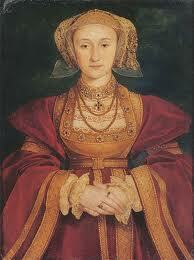 Within four months she married the love that she had given up to serve her King, Thomas Seymour. She would give birth to a daughter, Mary Seymour, but died of complications of the birth at the age of 36. Phew! What a wild ride! Divorced, beheaded, died, divorced, beheaded, survived- those were the wives of King Henry VIII. Okay, we love books. 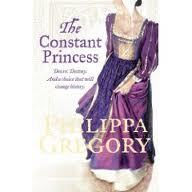 And we don’t hesitate one second to recommend historical fiction, especially Philippa Gregory historical fiction. Ahh, Twitter. Yes, you can get character tweets by following (only listing those with recent activity) Jane Seymour. Catherine Parr, Anne of Cleves, and Kathryn Howard all have accounts that seem to have been abandoned. If one of those women is your favorite, it seems like you have a project, right? 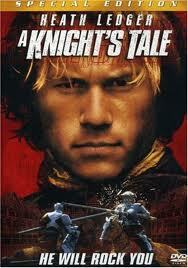 A Knight’s Tale is available for streaming on Netflix. As we continue in our Tudors series, we take some time to discuss the life of Henry VIII’s first wife, Katherine of Aragon. She was born from royal stock, had a wicked awesome role model for Queenly duties in her Mama, and lived the life that was planned for her from a very young age. Ok, so maybe she didn’t have exactly a storybook Queen’s life, but a Queen she was born to be, and a Queen she became. 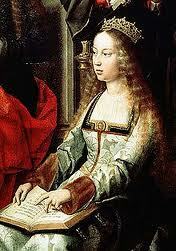 Born in 1485, Katherine (“Catalina”) was the youngest of five surviving children of King Ferdinand of Aragon, and Queen Isabela of Castille. Joint rulers of Spain. (And honestly, Isabela had a bigger piece of the pie.) Isabela was smart and fearless and lived her early years under the control of an older brother. She fought off arranged marriage after arranged marriage and eventually created a betrothal of her own on the sly, snuck out of the castle and married Ferdinand. 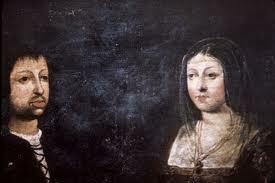 Once crowned joint rulers, this power couple took the fam on the on the road and began to acquire real estate all over what is modern day Spain. They tossed out Moor ( the Muslims of the area) and Jew alike in a period called, The Spanish Inquisition. We discuss what life was like during this time, the education of a young Princess, and some of the challenges of life, but young Katherine grew up not only on the road, but knowing where she would eventually put down roots. England. 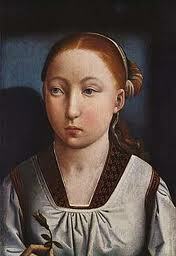 From the age of three she was promised to Arthur, first son of King Henry VII and the future ruler of England. You thought she looked like this, didn't you? Eventually, young Katherine left her warm, tropical homeland and set sail for cold, damp England. 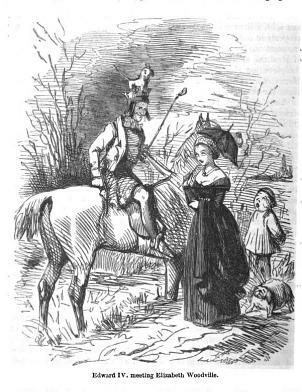 She was met with much fanfare (after a rather strenuous journey) and married her Prince. Who died on her a few months later. But, have no fear, Dowager Princess of Wales! King Henry has another son, you can marry him! In seven years, if we don’t find a better match for him first. And oh, do you mind living in less than regal living conditions until then? Great, thanks. For whatever reasons, once Papa Henry passed, and Henry VIII was crowned, he made good on his betrothal and married Katherine. For a while they seem quite content. She is advising him on political matters, while sewing his shirts and getting on the Baby Train. But the tracks are a little bumpy. Of seven pregnancies in nine years, they only have one living child, a daughter named Mary. But Henry is needing that heir. And he has a woman in his sights who he thinks can provide that. But first, he has to get out of this marriage. He thinks he has a loophole! Katherine had been married to his brother! That makes her his sister! And, yes, the Pope had agreed to the union, but Henry thinks he is being punished by God for it. At least that is what he claims. Yada Yada…England breaks from the Catholic church, Henry becomes Head of the Church of England and his marriage to Katherine is ended. Except Katherine is having none of this! Oh, it’s very dramatic, she is trying to save her place with the man she sees as her husband, AND trying to keep her daughter from becoming illegitimate. She tries to holds tight to her title as Queen. Unfortunately, she can’t hold tight enough. Henry is moving on to Wife number two, Anne Boleyn. On the day of her funeral, Wife Number Two, Anne Boleyn gives birth to a stillborn son. Interestingly, only four months after THAT, Anne Boleyn’s reign as Queen ends. Badly. But that’s a story for another episode! We start off our recommendations with some historical fiction. Here is a fantastic one…that is in good condition, unlike the one Beckett brought back to the library. We did tell you that you can get character tweets from “Katherine” but she hasn’t tweeted since November, so we can’t vouch for info in your feed. Here is a Henry VIII to fill the void. Luminarium.org is a wonderful online resource for all things British history! BBC’s Supersizesr Go! Elizabethan is on Youtube, here is a link to their channel. The episodes are broken up into parts (Elizabethan is six parts) but well worth the time. Funny and educational you don’t even know you are learning something! We love that! Margaret Beaufort and Elizabeth Woodville were both strong women who lived their lives during a tumultuous time when survival was key, but looking to the future for others close to you was also extremely important. On opposing sides of The Wars of the Roses they came together at one point to join the Lancasters and the Yorks and eventually became the grandmothers of Henry VIII. 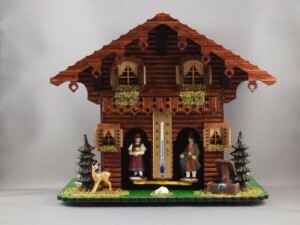 A Weather House. One figure is always going to be in the dark. We begin our talk with Margaret Beaufort, born the only child of John Beaufort, the first Duke of Somerset in 1443. He “worked” under Henry VI, but had a very dubious reputation of missing the battles in favor of shaking down the locals. His death left an infant Margaret, and her Lancastrian blood open for a wardship. Young Margaret is a catch based solely on her really fab ” luggage”. Of course she gets married off…at 6 or 7. The marriage is never a traditional one. Come on, she is a CHILD , and the law didn’t recognize such a young marriage anyway, A few years later the marriage is dissolved. So, young Margaret is up for a wardship again, and this time, it was given to the King’s half brothers Jasper and Edmund Tudor. Edmund, 24, became her first “real” husband when she was 12 years old. But within a year, Edmund had been taken prisoner by Yorkist forces and died of the plague while in captivity at Carmarthen, leaving young Margaret a seven-months-pregnant widow. At 13, after an agonizing and body altering delivery, she gives birth to what would be her only child, Henry Tudor…although you may know him more by his later title: King Henry VII. 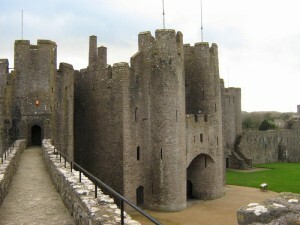 Pembroke Castle, where Margaret's son Henry Tudor was born. We discuss her life, how Henry was raised, her third marriage to Henry Stafford, and her fourth marriage to Thomas Stanley. We talk about some of the other challenges she had in life but during all this time she has thought that her one son, Henry, was destined for greatness. The opening came as Richard III is knocking off those in line to the throne. This vile act brought Henry closer and closer to the top of the list, and as history ( and our previous Quaruple T podcast) reports, with a rag tag army scrapped together on the way to battle- Henry Tudor claims the crown. And Margaret? Just call her, M’lady, the King’s Mother. This is where the stories of Margaret and Elizabeth merge. Through some behind the scenes action, their children- Henry and Elizabeth of York- marry combining the York and Lancaster lines. We would have loved to have been privy to some of the conversations happening at Court during this time. 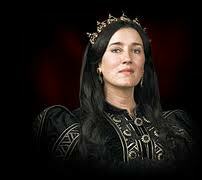 The Mothers- one the Dowager Queen, the other the King’s Mother, and then add in a third woman, now Queen Consort. Talk about your Golden Girls! At court she has a lot of influence over her son, and we discuss all of the dynamics of this time and the rest of the lives of both Elizabeth, the White Queen (we have a thing for Philippa Gregory’s The White Queen and the Red Queen novels) and Margaret, the Red Queen. 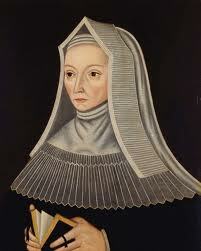 Elizabeth Woodville was a bit older than Margaret Beaufort, and was born in 1437. She was the first child of Richard and Jacquetta (why couldn’t that name be passed down? So much more interesting than Elizabeth or Mary…oh, sorry, you know how we love to carry on about that!) Woodville. She was also born into a fairly wealthy family, although we like to think that this one was a marriage made from a love match. Because we are romantic like that. Elizabeth, in addition to family connections, was a very beautiful woman and by about age 15, she was married to her first husband, Sir John Grey. From this marriage she had two sons, Thomas and Richard, and they lived a fairly quiet life for the times until his death in battle nine years later. The origins of Elizabeth’s second marriage are open to speculation. 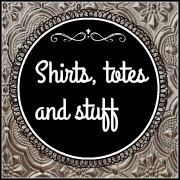 And oh, you know how much we love that! Did she wait by a tree, holding the hands of her two young sons as an advertisement that she was a boy producer, and wait for Edward IV to ride past? Was there some sort of witchcraft involved? Did she attract his attention and then use her powers as a beautiful and desirable woman to get him to wed her? Whatever the case, Elizabeth and the Take No Crap King were married in secret. Elizabeth, as the Victorians saw her. Wait - this isn't Red Riding Hood? The family that she married into isn’t exactly protective of their own, and not beyond mayhem. We talk about some of that, but really, you will need to research it on your own to get all the deets, there was A LOT of mayhem. Bad, meyhem. But Elizabeth did her queenly duty and began producing children, first up the child who would grow up to be Queen herself, Elizabeth of York. Mama Elizabeth has 10 children in 14 years (who survived infancy) including two sweet young boys who will forever be known as The Princes in the Tower. What happens to Elizabeth and her children after her husband dies was covered by us in our QuadT podcast. And thinking about it makes us sad, so can we skip on now to the part where Elizabeth and Margaret’s lives intertwine? Wow, that’s kinda sad too. Ok, here it is in a nutshell: Mama Elizabeth is looking at two options for her daughter, one Richard III (Scar!) who had her family killed, or the other Henry Tudor who hasn’t really done much since he was hanging out in France most of his life, waiting in the wings. At the Battle of Bosworth Richard III is taken out. Elizabeth and Margaret support the marriage of their children after Henry took the crown. They are all living at Court now, one big dysfuntional family. But, once Elizabeth of York becomes Queen, and Mama Elizabeth has Margaret Beaufort nipping away at her Elizabeth leaves Court and takes up residence at Bermondsey Abbey. And that is pretty much the end of the tale for Elizabeth who lives out her life there. Quietly, again. But what remained? Most notable a the grandson to both of these women: Henry VIII was the second born son of Henry Tudor and Elizabeth of York. And what Henry VIII did was legacy making indeed. 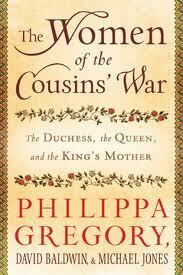 For book recommendations, we again suggest Philippa Gregory’s The White Queen, and The Red Queen. (Recommended on QuadT shownotes, as well). 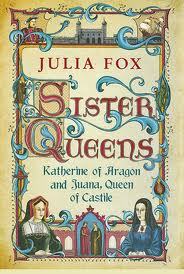 Yes, historical fiction, but will really color in the rainbow of your ideas of Margaret and Elizabeth. Non-fiction, you say? 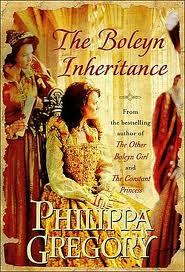 Philippa Gregory we respond (again). 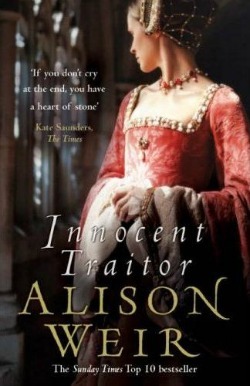 And really, for some history fun, please go check out Tudor Confessions!